AKSARBENT: Antiquarium Bookstore: rumours of its demise greatly exaggerated; lost Orson Welles radio ad touting the shop; a discount for AKSARBENT readers! 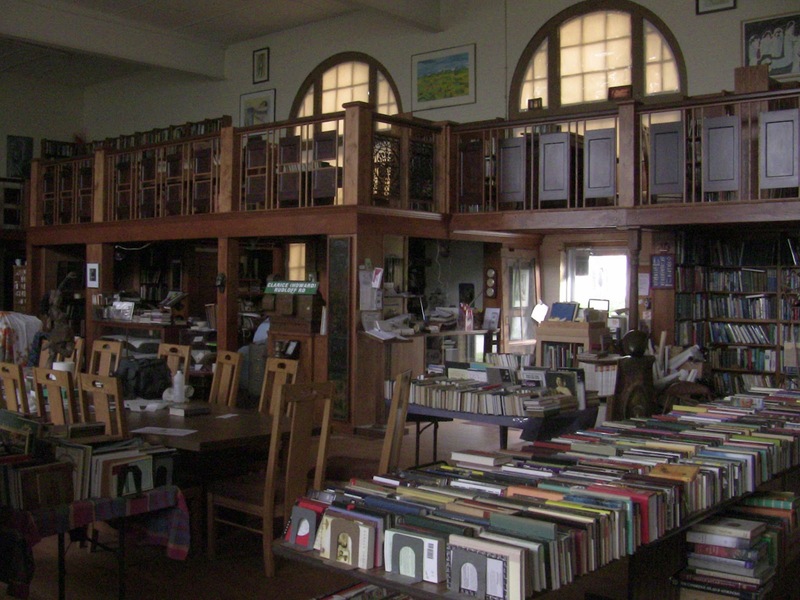 Antiquarium Bookstore: rumours of its demise greatly exaggerated; lost Orson Welles radio ad touting the shop; a discount for AKSARBENT readers! Update: Antiquarium founder has passed away. Details here. 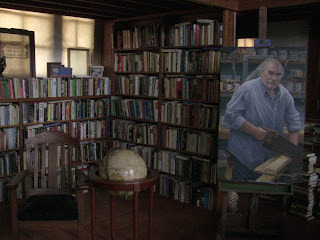 AKSARBENT drove a friend back to Missouri yesterday and on the way, stopped to book browse at an old favorite, the Antiquarium bookstore, now in Brownville (an arts community 90 minutes south of Omaha off I-29), where owner Tom Rudloff is discretely having the last laugh on Borders. Though we scarcely thought it possible, we liked the current venue even more than the former one; the new space (in a converted school's gym) soars, but still offers alcove after alcove, cleverly supporting the catwalks and built by Al Strong (the carpenter in the portrait), who was the King, Queen and Royal Family of construction material recycling, a connoisseur extraordinaire of iridescently loud Aloha shirts and the first person to point out to us how much of a bargain Maker's Mark was when first introduced. The Antiquarium's new Brownville location, a block south of Main on Fourth Street. I don’t remember the first time I went to the Antiquarium or met Dave Sink. It all just kind of happened. I suppose I would have been twelve or so, just tagging along with my brothers and the older kids from the neighborhood. Whenever that was I know I could not have known then that that place would become the epicenter of discovery for my musical life (and life in general) and probably the single most sacred place of my adolescence. AKSARBENT didn't leave empty-handed. We snagged a copy of Phillip Norman's SHOUT! : The Beatles in their generation, the definitive biography of the supergroup. At Amazon.com, the paperback is fetching $11.55, but we paid $4.50 plus tax — for a hardcover. Ah, memories. Count me among those who wish they could afford to buy the Antiquarium building. I was lucky enough to know Dave Sink before he was the godfather of indie rock, when he was a reporter at the Sun Newspapers and a part-time instructor at UNO. When the Sun papers were closing, Dave took on what was a bunch of disorganized vinyl albums, ruthlessly winnowed out the worn-out, the hokey, and the just plain unsellable and made a small room the best used record shop in town. Learned on the job, really, since he didn't consider himself any kind of music expert. It's his fault I found the Antiquarium, really. I hope Tom is doing well and the bookstore continues to thrive. The world would be a poorer place without it. Tom Rudlof...what a mensch! He really encouraged and supported me as an intellectual as well as a vocalist and performer when I was trying to find my path back in the day. The Antiquarium was a hang out for social/political pundits, chess and trivial pursuit marathons, band rehearsals and art show openings. It was a place where you find other like minded folks have a coffee and hang out in the stacks. I am happy to read that it continues in whatever form and that Tom is doing well. Worth mentioning that Brownville has a couple of other bookstores, restaurant, winery, and stores. Great historic town to spend the weekend. I don't believe it is Orson Welles doing the voiceover on this ad. This is Alexander Scourby. He did all the Eastern Airlines TV commercials for many years starting in the 1970's. Scourby was a movie and stage actor who also narrated more than 400 of the Talking Books recordings...including several versions of the Bible. He was described by a columnist in the Chicago Tribune as having" the best voice ever recorded." Orson Welles replaced Alexander Scourby as the voice of Eastern in one of his first commercial voiceover jobs. Apparently feeling that the new campaign demanded a level of music mere jingle-writers and film composers could not deliver, Y&R instead turned to classical music as arranged by Robert Russell Bennett.60 “By then we’d had it with the Big Melody Thing,” explained a Y&R executive later.61 Eastern executives proudly told the press that the music had been recorded by the London Symphony Orchestra — in fact most of it was recorded by session musicians,62 but the connection to the LSO gave the campaign added grandeur.